Fishermen who tether their boats at the Wiso River estuary need to find a temporary solution to ensure the smooth running of their activities. Fishermen who tether their boats at the Wiso River estuary need to find a temporary solution to ensure the smooth running of their activities. This was conveyed by the Deputy Chairperson of the Jepara Regency DPRD, Pratikno, Friday (10/1). At that time, Pratikno and Chairman of Commission D Masykuri and members of the commission, saw first hand the condition of the Wiso River. This review was carried out after Commission D received a complaint from the Joint Business Group (KUB) "Jaya Bahari" which consisted of a portion of Jobokuto Village fishermen. They said, fishermen had difficulty getting in and out of the estuary due to siltation of the river. "Commission D will coordinate with relevant Regional Devices who know the technical process. What is clear is that it does need dredging so that the boat is easy to get in and out, "said Pratikno while at the location, right in front of the Jepara Syahbandar Office complex. The Chairperson of Commission D Masykuri and members of the Commission, Chairman of the Indonesian Fishermen Association (HNSI), Jepara Sudiyatno, Head of KUB Jaya Bahari Sugiyarto and members, and representatives of the Jepara Syahbandar Office, Sugito, were present. In this observation, the Wiso River estuary was severely silenced. Soil sediment causes the water flow not to be in the middle of the river, but shifts to the south side. But what fishermen are most worried about is not soil material. But cast marks on the banks of the river are now a line of water flow. The material besides complicating boat traffic, also poses a threat to passing boats. "Before there was a permanent solution, the temporary solution, yes, was indeed dredged," said Pratikno. The politician from the Nasdem Party said that the temporary solution was needed because HNSI Jepara had already communicated with relevant parties, both at the provincial and district levels. This was in accordance with the report of the HNSI Chairperson Jepara Sudiyatno, during a joint hearing at the Jobokuto Village Office, just before the group visited the location. Audience moderated by Jobokuto Village Chief Adi Winarto. 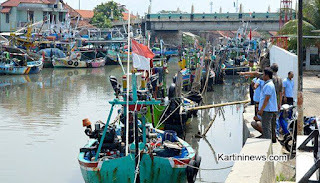 "Actually fishermen in Jepara are members of the HNSI. And we are always at the front in the issue of fishermen. But this complaint from friends of KUB Jaya Bahari did not go through me, so they did not know that actually the HNSI had already stepped in, "Sudiyatno said in an audience. The move, continued Sudiyatno, began with talks with Syahbandar Jepara to the Governor of Central Java. "This group does not yet know that actually in 2019 there will be dredging the Kali Wiso estuary. It's just that the momentum is not right because it is related to scheduling and tide or ebb, "he explained. While Chairman of Commission D Masykuri said, his party was ready to follow up on the direction of the board of directors. The technical implementation of joint problem-solving efforts will be submitted to the Regional Devices concerned so that dredging does not damage the river's tombs.